When we entered the second quarter in April, I gave an update to the status indicating a move into stage 2 with very little no details. Well, I’m back, and I have another update. I’m actually a month early, but, for reasons that will become obvious to you soon enough, I am pulling the trigger on filling in some details now. Turns out, you’ve been part of it all along in this 6 month trip. Most of the restaurant reviews and recipes have been documented as part of my quest, part of Operation: nWo. If you follow me on twitter, you see my (ever declining) number of tweets focused on my excursions to the gym. You see, life’s a journey. I say it a lot, you can’t live in regrets and “should haves” and “would haves” because whatever happened happened. This could be one of the only ways real life is like the television show, LOST. There was a time whenI was working out over 2 hours a day, weighing a sickly162.5 lbs (you don’t get to see that picture yet), eating 1800 well-timed calories. That had to stop when I entered the real-world and had to deal with working full time. But I didn’t make any concerted effort to fit the diet and exercise. This isn’t about making excuses. It’s about telling a story. The truth is that I love my nWo shirt. And until 2009, it fit me, snugly, but it fit. After that, I couldn’t represent the band. Much of my mass (i.e. problem area) is in my gut, and even the picture illustrates that this shirt may have been a little, let’s say, short for my build. Believe it or not, there’s a physical explanation other than my figure for that. 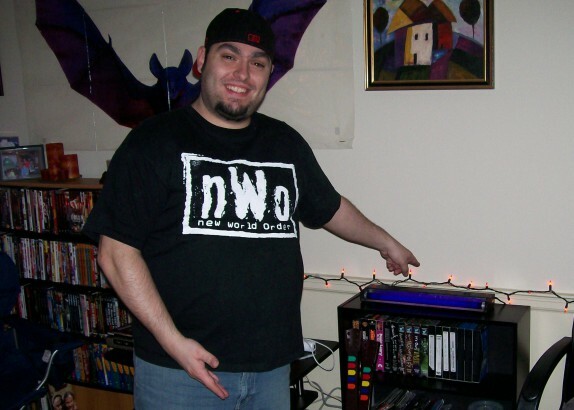 I recently acquired a brand new nWo shirt, the same size (Men’s XL), from the same lot of production, purchased at the same time as the shirt in this image. Said shirt was revoked from someone who should have never been able to touch one in the first place and still had the tags attached. This shirt fits me great right now. Having been worn multiple times, my shirt has been washed and dried a number of times. But my goal isn’t to fit into the new shirt. At the end of quarter 2, I will fit into my nWo shirt. …and, believe it or not, that was the overall goal for all of 2011. What do I have planned in quarters 3 and 4?